A team of Maui artists are among a team painting murals throughout Wailuku and Central Maui in partnership with the international nonprofit organization PangeaSeed Foundation . 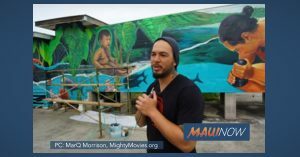 MarQ Morrison, with MightyMovies.org filed this mini-doc on one of the murals located at Restaurant Matsu Japanese Cuisine in Kahului. The murals are part of a public art program through PangeaSeed Foundation, an international nonprofit that has created 300 murals in 14 countries with a roster of more than 250 professional artists. The Maui Redevelopment Agency, the Office of Economic Development, Pacific Whale Foundation, and other organizations are funding the project. Maui-born artist Matt Agcolicol is coordinating the mural project, which involves about 20 artists primarily from Hawaiʻi. The Maui artists participating in the project include Noble Richardson, Amanda Joy Bowers, Kirk Kurokawa, and Elmer Bio Jr.